Definition at line 220 of file ssl_common.h. Definition at line 222 of file ssl_common.h. Definition at line 233 of file ssl_common.h. Referenced by tls_crypt_v2_extract_client_key(), tls_pre_decrypt_lite(), and tls_wrap_free(). 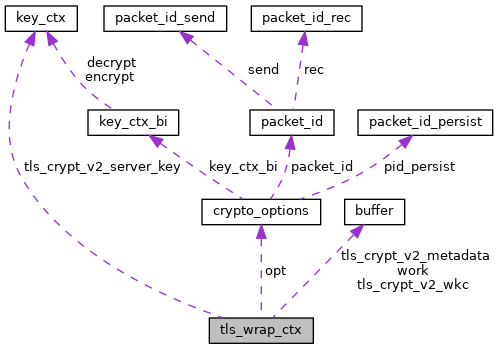 Referenced by do_init_crypto_tls(), read_control_auth(), tls_crypt_v2_extract_client_key(), tls_crypt_v2_wrap_unwrap_max_metadata(), and write_control_auth(). Definition at line 227 of file ssl_common.h. Referenced by do_init_crypto_tls(), read_control_auth(), tls_auth_standalone_init(), tls_crypt_v2_extract_client_key(), tls_pre_decrypt_lite(), tls_session_init(), tls_wrap_free(), and write_control_auth(). Definition at line 232 of file ssl_common.h. Referenced by tls_crypt_v2_extract_client_key(), tls_crypt_v2_verify_metadata(), tls_pre_decrypt_lite(), and tls_wrap_free(). Definition at line 229 of file ssl_common.h. Referenced by do_init_crypto_tls(), read_control_auth(), and tls_crypt_v2_extract_client_key(). Definition at line 230 of file ssl_common.h. Referenced by do_init_crypto_tls(), and write_control_auth(). Definition at line 228 of file ssl_common.h. Referenced by tls_session_init(), tls_wrap_free(), and write_control_auth().